The Brooklyn Bridge (originally the New York and Brooklyn Bridge), one of the oldest suspension bridges in the United States, stretches 5,989 feet over the East River connecting the New York City boroughs of Manhattan and Brooklyn. On completion, it was the largest suspension bridge in the world and the first steel-wire suspension bridge. Since its opening, it has become an iconic part of the New York Skyline. Construction began in January 3, 1870. The Brooklyn Bridge was completed 13 years later and was opened for use on May 24, 1883. On that first day, a total of 1,800 vehicles and 150,300 people crossed. Now, the bridge carries an average of 145,000 vehicles per day. The bridge's main span over the East River is 1,595 feet, six inches. The bridge cost $15.1 million to build and approximately 27 people died during its construction. Over the course of New York's history, the Brooklyn Bridge has become a treasured landmark. The bridge was designed by an engineering firm owned by John Augustus Roebling in Trenton, New Jersey. Roebling and his firm had built earlier and smaller suspension bridges, such as Roebling's Delaware Aqueduct in Lackawaxen, Pennsylvania, the John A. Roebling Suspension Bridge in Cincinnati, Ohio, and the Waco Suspension Bridge in Waco, Texas, that served as the engineering prototypes for the final design. The bridge is built from limestone, granite, and Rosendale natural cement. The architectural style is Gothic, with characteristic pointed arches above the passageways through the stone towers. Since the 1980s, it has been floodlit at night to highlight its architectural features. It was fortunate that the open truss structure supporting the bridge's deck is by its nature less subject to aerodynamic problems than other designs. At the time the bridge was built, the aerodynamics of bridge building had not been fully worked out. Bridges were not tested in wind tunnels until the 1950s—well after the collapse of the Tacoma Narrows Bridge in the 1940s. Roebling designed a bridge and truss system that was six times as strong as he thought it needed to be. Because of this, the Brooklyn Bridge is still standing when many of the bridges built around the same time have vanished into history and have been replaced. This is also in spite of the substitution of inferior-quality wire in the cabling supplied by the contractor J. Lloyd Haigh. By the time this was discovered, it was too late to replace the cabling that had already been constructed. Roebling determined that the poorer wire would leave the bridge four rather than six times as strong as necessary, so it was eventually allowed to stand, with the addition of 250 cables. Diagonal cables were installed from the towers to the deck, intended to stiffen the bridge. This turned out to be unnecessary, but they are kept for their distinctive beauty. 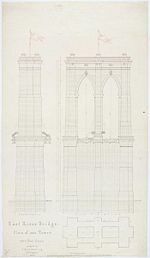 Plan of one tower for the Brooklyn Bridge, 1867. As the construction began, Roebling's foot was badly injured by a ferry when it crashed into a wharf; within a few weeks, he died of tetanus caused by the amputation of his toes. His son, Washington, succeeded him, but was stricken in 1872 with "caisson disease" (decompression sickness, commonly known as 'the bends'), due to working in compressed air in caissons. This disease also caused him to halt construction of the Manhattan side of the tower 30 feet short of bedrock, when soil tests underneath the caisson found bedrock to be deeper than expected. Today, the Manhattan tower rests only on sand. Washington's wife, Emily Warren Roebling, became his aide, learning engineering and communicating his wishes to the on-site assistants. Washington Roebling rarely visited the site again. When the Brooklyn Bridge opened on May 24, 1883, Emily Roebling was the first person to cross it. At the time it opened, it was the longest suspension bridge in the world, 50 percent longer than any previously built. Additionally, for several years the towers were the tallest structures in the Western Hemisphere. The opening was greeted by a wave of enthusiasm for the engineering marvel. However, less than a week later, on May 30, 1883, a rumor that the Bridge was going to collapse caused a stampede which crushed and killed 12 people. The first person to jump from the bridge was Robert E. Odlum on July 23, 1886. Odlum, a swimming teacher, made the jump in a costume bearing his initials. He survived the pre-announced jump, but died shortly thereafter from internal injuries. In its early years, the bridge carried horses and trolley traffic, as well as pedestrians. At present, it has six lanes for motor vehicles, carrying an average of 145,000 vehicles per day, with a separate walkway along the centerline for pedestrians and bicycles. Due to the roadway's height (11 feet posted) and weight limitations (6,000 lbs. posted), commercial vehicles and buses are prohibited from using the bridge. 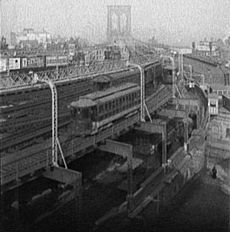 The two inside traffic lanes once carried elevated trains of the Brooklyn-Manhattan Transit Corporation (BMT) from Brooklyn points to a terminal at Park Row in Manhattan. Streetcars ran on what are now the two center lanes, shared with other traffic, until the elevated lines stopped using the bridge in 1944. In 1950, the streetcars also stopped running, and the bridge was rebuilt to carry six lanes of automobile traffic. The Brooklyn Bridge currently has a center lane open to bicycles and pedestrians, elevated above automobile traffic. While the bridge has always permitted the passage of pedestrians across its span, its role in allowing thousands to cross takes on a special importance in times of crisis and becomes a symbol of New Yorkers' resilience. During transit strikes by the Transport Workers Union in 1980 and 2005, the bridge was used by thousands of pedestrians commuting to work, with Mayors Ed Koch and Michael Bloomberg crossing the bridge to show solidarity with the inconvenienced public. Following the 1965, 1977, and 2003 power blackouts, and most famously after the September 11, 2001 attacks on the World Trade Center, the bridge was used by shocked citizens in Manhattan to leave the city after subway service was suspended. On March 1, 1994, Lebanese-born Rashid Baz opened fire on a van carrying members of the Chabad-Lubavitch Orthodox Jewish Movement, striking 16-year old student Ari Halberstam and three others traveling on the bridge. Halberstam died five days later from his wounds. Baz was apparently acting out of revenge for the Hebron massacre of 29 Muslims by Baruch Goldstein that had taken place days earlier on February 25, 1994. Baz was convicted of murder and sentenced to a 141-year prison term. After initially classifying the murder as one committed out of road rage, the FBI reclassified the case in 2000 as a terrorist attack. The entrance ramp to the bridge on the Manhattan side was named the Ari Halberstam Memorial Ramp in memory of the victim. In 2003, truck driver Iyman Faris was sentenced to 20 years in prison for providing material support to al-Qaeda, after an earlier plot to destroy the bridge by cutting through its support wires with blowtorches was canceled. At the time of its opening, the bridge quickly became a symbol of the optimism of the time. John Perry Barlow wrote in the late-twentieth century of the "literal and genuinely religious leap of faith" embodied in the Brooklyn Bridge. In his second book The Bridge, Hart Crane begins with a poem entitled "Poem: To Brooklyn Bridge." The bridge was a source of inspiration for Crane, who purchased several apartments specifically to have various views of the bridge. 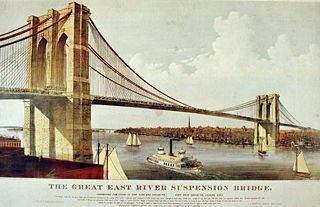 References to "selling the Brooklyn Bridge" abound in American culture, sometimes as examples of rural gullibility, but more often in connection with an idea that strains credulity. For example, "If you believe that, I have a bridge in Brooklyn I would like to sell you…"
The bridge was placed on the National Register of Historic Places on June 17, 1977 and on March 24, 1983 was designated a National Historic Engineering Landmark. 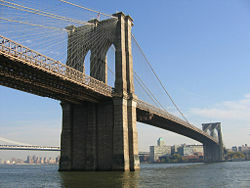 The bridge has figured prominently in numerous motion pictures, including: Superman Returns (2006), Godzilla (1998), Deep Impact (1998), Gangs of New York (2004), Sophie's Choice, and several others. A television show called Brooklyn Bridge aired in prime time from 1991 through 1993 on CBS, featuring a Jewish family from Brooklyn. The Brooklyn Bridge, as seen from Manhattan. ↑ A watertight structure within which construction work is carried on under water. ↑ Life Magazine May 24, 1954. Retrieved January 20, 2008. ↑ Ari Halberstam Memorial Ramp Retrieved January 20, 2008. Panorama of Brooklyn Bridge 1899 - Extreme Photo Constructions www.dualmoments.com. This page was last modified on 6 July 2016, at 22:38.